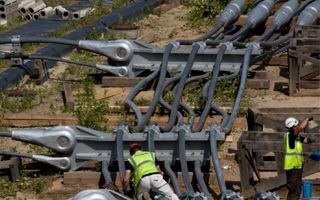 July 2011: During final stages of the big lift operation at Stadion Śląski two “crocodiles” (fixing elements for steel ropes nicknamed for their crocodile-head resemblance) are torn and the roof has to go down. Series of analyses suggest the roof was designed incorrectly and would not withstand normal use. June 18, 2015: After examinations, tests and change of contractors that same operation begins again today. 830 tons of steel cables (11km total length) are once more being lifted from the ground. Stadion Śląski’s cable roof will take two weeks to reach final height of roughly 30 meters. The roof cables create two conjoined “spider webs” of 40 cables each. Upper web will bring the roof to place and assure it keeps position regardless of weather conditions, etc. Lower ring will provide support for polyurethane sheets. Currently all 40 upper cables are being pulled up simultaneously and should average 2 meters upwards per day. Everyone may follow the lifting process online via webcams [updated every 3 minutes]. The 2011 accident was the first of its kind worldwide and brought nearly 4 years of standstill to the megaproject. This caused the 55,000-capacity Stadion Śląski’s price tag to skyrocket. It’s unclear at this point how much the stadium will cost in total, but is already over 5 times (!) more expensive since earliest expectations from 2007. Current estimates put it at over PLN 600 million (€156m / $180m).